Stand a chance to win a brand new Nissan Micra! Emnotweni Rewards cardholders can enter our exciting Money and The Box promotion. 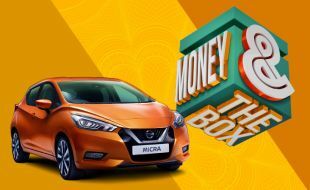 We are giving away a share of over R875,000 including a funky Nissan Micra! Make sure you come and play for your chance to win big. The launch draw took place on 13 September at 20h00. Points earning for the Money and The Box promotion will commence on 13 September from 08h00 and will end on 25 October at 07h59. We will be hosting weekly Multiplier CASH draws, for which you need to earn 850 points per week to enter. To qualify for the CAR draw, you need 3,000 points per entry. Weekly draws will take place on Thursdays from 20 September to 25 October – totalling 6 draw dates. You will need to earn 850 points per week per entry ticket. There is up to up to R45,000 per hour or R90,000 per day which can be won during these draws. Electronic draws will take place on the main stage. 5 winners are drawn per hour at 19h00 and 20h00, winning a guaranteed amount of R5,000. The final CASH draws will use the same mechanics as the weekly multiplier draws. To enter the car draw, you will need to earn 3,000 points per ticket for your chance to win a brand new Nissan Micra. Points earning for the 3,000 points start on 13 September until 07h59 on 25 October 2018. An elimination process will take place to determine the winner of the Nissan Micra. The 2 runners-up will receive R5,000 each and the 1st prize will be the Nissan Micra as well as R5,000 in CASH. Any person who is under 18, or who has been issued with a Refusal of Entry order, or who is self-excluded, or who falls into any category of excluded persons, is expressly prohibited from gambling and/or participating in this promotional competition. This promotional competition is exclusive to Emnotweni Black and Platinum Rewards Programme members (the “Participants”), and it is closed to any persons who are directors, members, partners, employees, agents or consultants of or any other person who directly or indirectly controls or is controlled by the company or marketing service providers, or spouses, life partners, business partners or immediate family members. Participants earn points by playing Slots or Tables whilst using their Emnotweni Rewards cards during the Promotional Period of 13 Sept – 25 Oct 2018. This promotion is open to Emnotweni Rewards cardholders only. Entries cannot be purchased for cash, through any other form of consideration only points earned during the promotional period will be considered. Final draw, 5 lucky finalists will be drawn to participate in the promotional game, to determine the prizes including Cash winner. Participants enter the draw by printing/activating their draw ticket/receipt at the eHost on the day of the draw within the advertised times. The opening and closing times for entry activations for the draws will be from 12h00 until the start of the draw. All Participants are required to be present at the draws on the respective dates/times to be eligible for a Prize: Provided that if a participant elects not to be present in person when the winner/s are announced, the participant may nominate another person who has been duly authorised in writing to attend the draw on behalf of a participant in the form and manner determined by management, the details of which will be available at the Customer Service Desk. Prescribed proxy nomination forms will be available for this purpose from 12h00 on the day of the draw until 15 minutes before the start of the draw for which the proxy is to be nominated. Proxy nomination forms will be available at the Customer Service Desk. Prize winners or nominated Proxies who are present will be given 90 seconds to present themselves and must be in possession of evidence of the winning ticket and/or rewards card belonging to the winner and; positive and acceptable form of identification. Positive and acceptable form of identification may also be verified on the Casino Gaming Management System. The prize winner must claim the prize at the casino within 15 days of the draw from the Marketing department. Prize winners that do not claim their prize on the day will be contacted by means of contact details provided. The motor vehicle dealership’s terms and conditions, in all respects, shall apply to the motor vehicle prizes.